Seven Types of Parallelism in Hebrew Poetry: Hebrew poetry has a distinctive type of sentence. It is called parallelism. Parallelism is best described as two or more lines that use different words but similar grammatical form to explain the same idea. English poetry is usually based upon rhyme and meter whereas Hebrew poetry is usually based upon rhythm and parallelism. In other words, Hebrew poetry is based on “thought lines” and not rhymes like English poetry. 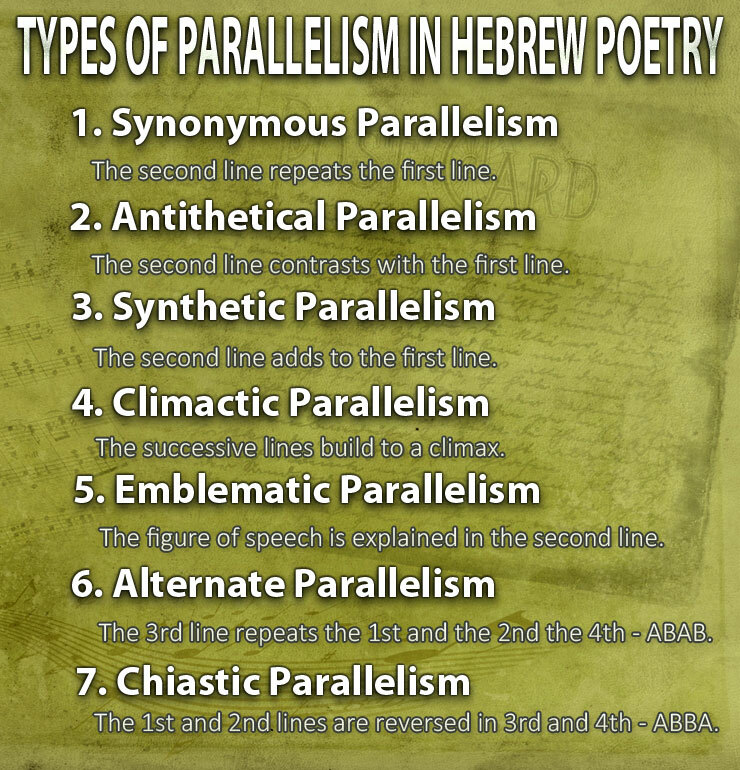 There are several ways to categorise the different types of parallelism in Hebrew poetry. Some scholars categorise them as major types and sub types but for simplicity, I will categorise them as seven types of parallelism in Hebrew poetry. This is the most common of the parallelism in Hebrew poetry. In a synonymous parallelism, the second line repeats or restates the idea in the first with different words having a similar meaning. In other words, synonymous parallelism became a way to say the same thing twice. This type of parallelism employs the use of contrast in that the second line is contrasted with the first line. Sometimes one lines states the idea positively and the other states the idea negatively. In other words, antithetical parallelism marks a contrast in order to make a distinction. “The LORD of hosts is with us; the God of Jacob is our refuge” (Psalm 46:7). In synthetic parallelism the second line develops further the idea of the first line. “He will not let your foot slip; he who watches over you will not slumber” (Psalm 121:3). The climactic parallelism develops the thought in line by repetition and builds to a climax with additional material. “Ascribe to the LORD, O might ones, ascribe to the LORD glory and strength. Ascribe to the LORD the glory due his name; worship the LORD in the splendour of his holiness” (Psalm 29:1-2). “Ascribe to the LORD, O families of the peoples, ascribe to the LORD glory and strength” (Psalm 96:7). An emblematic Parallelism takes an idea in either first line or the second line and illustrates that idea in either the second line or first line with a symbol or metaphor. In the first example below, the figure of speech in the first line is explained in the second line. In the second example, ideas is presented in the first line and illustrated in the second line. “As the dear pants for streams of water, so my soul pants for you, O God” (Psalm 42:1). “O Sovereign LORD, my strong deliverer, who shields my head in the day of battle” (Psalm 140:7). In an alternate parallelism, the third line repeats the first line and the fourth line repeats the second line to give the ABAB pattern. “For as high as the heavens are above the earth, so great is his love for those who fear him; as far as the east is from the west, so far has he removed our transgressions from us” (Psalm 103:11-12). “In the shelter of your presence you hid them from the intrigues of men; in your dwelling you keep them safe from accusing tongues” (Psalm 31:20). In a chiastic parallelism, the first and second lines are reversed in the third and fourth lines to give the ABBA pattern. “We have escaped like a bird, our to the fowler’s snare; the snare has been broken, and we have escaped” (Psalm 124:7). “Every day I will praise you and extol your name for ever and ever” (Psalm 145:2). It is advantageous to identify the different types of parallelism in Hebrew poetry but it is not essential to interpretation because by itself parallelism rarely affects the meaning of a statement or idea. So want is the function of parallelism in Hebrew poetry? English poetry demonstrates the skillful handling of language through rhyme and meter; whereas, Hebrew poetry demonstrates the skillful handling of language through rhythm and parallelism. The writers of Hebrew poetry were skillful artists with a great love of beauty and eloquence. “Ascribe to the LORD, O mighty ones, ascribe to the LORD glory and strength. Ascribe to the LORD the glory due his name; worship the LORD in the splendor of his holiness” (Psalm 29:1-2; NIV). Hebrew parallelism reinforces a thought in our consciousness with repetition. It labored the idea for the reader to gasp the truth before the reader move on. “Bless is the man who does not walk in the counsel of the wicked, or stand in the way of sinners, or sit in the seat of mockers” (Psalm 1:1). 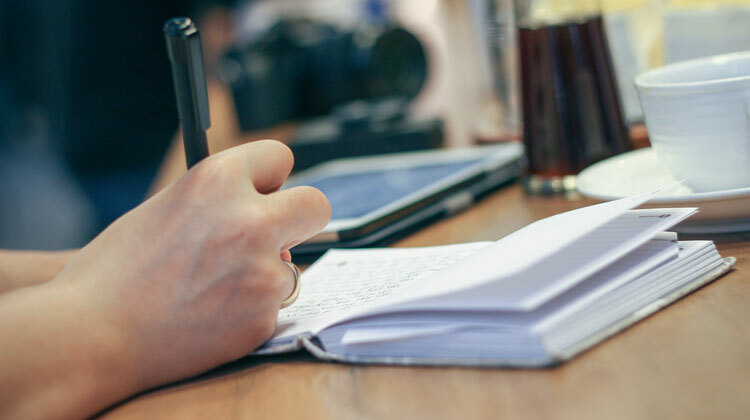 If you gain the ability to identify the seven types of parallelism in Hebrew poetry, you will enhance your preaching ability. You will learn to model parallelism in your own preaching by restating truth in a variety of ways which makes for vivid expressions of the truth. 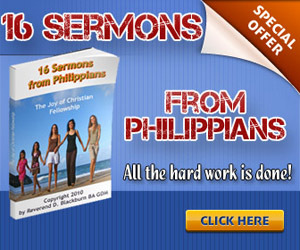 Let’s face it; repetition communicates truth very effectively from the pulpit. If you want to learn more about the seven types of parallelism in Hebrew poetry, the books below are very helpful. Most of what is written above was garnered from the books below.